You will take the new skills you already learned and practice them in the river. We will run a sporty section of the Bow west of Cochrane, practicing as we go. Our certified instructor and the low participant:instructor ratio will ensure a fun, comfortable, safe and educational experience! 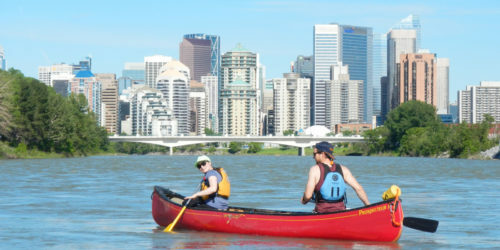 Upon completion of this course, you will have the skills and confidence to paddle your canoe on easy rivers like the Bow River west of Calgary, and many others! 1:8 (MAX) to ensure you of the best instructional experience possible! Canoe and related gear is provided. This clinic is designed for adults - all participants must be at least 16 year old. Children 12-15 are welcome to participate if a parent is also registered in the clinic. Successful completion of Canoe the River is the minimum. Completion of River Canoe Next Step is better.